Many people dream of having their own swimming pool. And indeed it would be great to go for a swim every day. We all love swimming! But the thing we don’t think about during our daydreams is that being a pool owner also means that we have to take care for our pool. There’s a lot of hard work: cleaning, balancing the chemicals, cleaning and maintaining the equipment, opening and closing the pool. The list goes on and on. Most pool owners dislike this tasks and hire a pool service to do that. 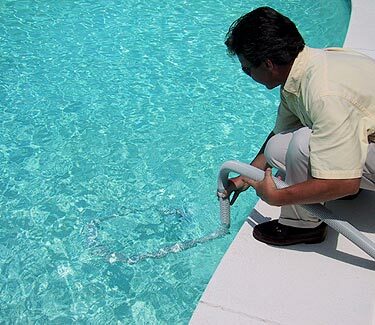 Besides that, it is advisable to hire a pool service because these people are specialists who know everything you need to know about the chemicals and the technical details of your pool set (filters, pump, etc.). Pool owners in colder regions need to close their pool in winter and reopen it in spring. This requires a lot of work. The equipment has to be cleaned, the ladders and diving boards have to be removed. The water has to be drained below a certain point in order to prevent it from freezing. What does a pool service cost? Most pool services charge around $200 – $400 per month. This depends mostly on the area you live in. If you live in California, there are much more companies that compete against each other, this will lower the prices. If you live in a state where there are few pool, there are probably also few pool service companies and the lack off competition will allow them to charge a higher amount per month. But there are also other factors like the size and depth of your pool. Additionally to that, you have to pay extra fees for the opening and closing of your pool (provided that you have to close it in winter) and reparation of broken equipment.